Alan Hollar is a wood carver from Crossnore. He stands about 6-foot-seven and wears a ball cap and big frame glasses. 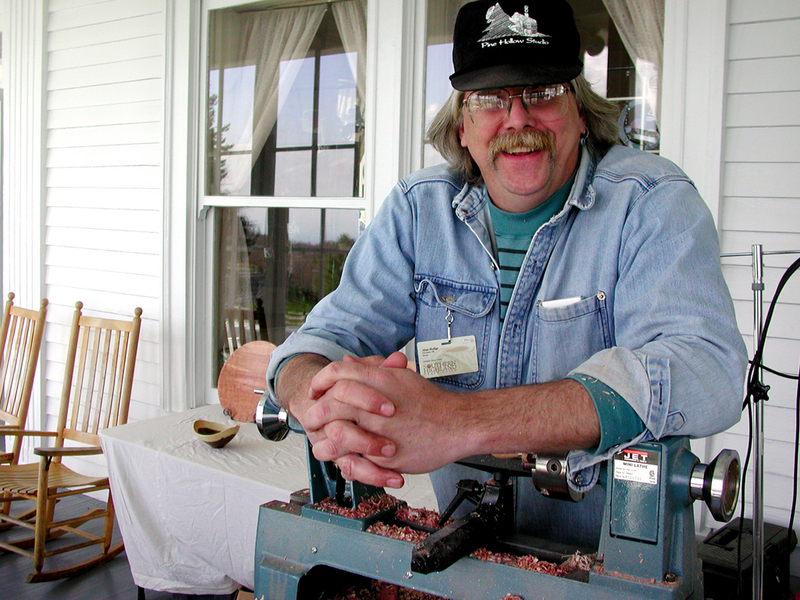 He is giving demonstrations on cutting lathe-turned wood bowls at the craft center at the Moses Cone mansion along the Blue Ridge Parkway. The craft center is a kind of fantasy world, filled with quilts, stained glass, preciously carved wood and beautifully glazed pottery. As soon as you enter, you are hit with the odor of sachet and the sound of Irish flute and dulcimer music. None of this has anything to do with the Appalachian Mountains, except as it is marketed to wealthy yuppies looking for faux-authentic mountain crafts. 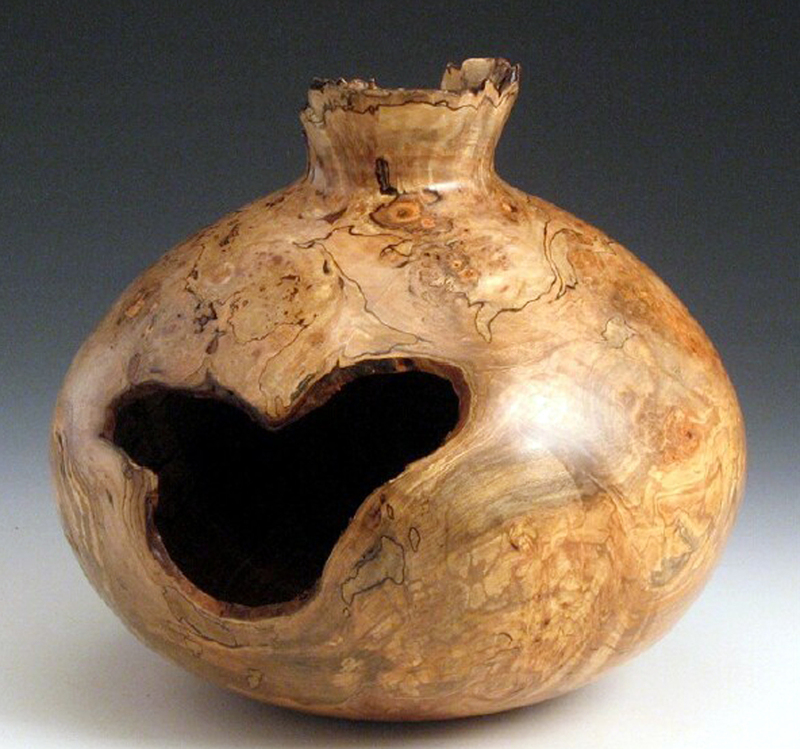 Appalachian mountain crafts has suffered from the same forces that stultify Native American arts. both cultures have not stood still and are part of the same 21st century that we all live and breathe, but the market has identified their niches, and forced a “brand” or identity on them that is inauthentic. Despite his warning, the market for so-called “traditional” Native American art is clotted with talking blue coyotes, lance-carrying warriors and never-ending rainbirds. And the inevitable “Bambi paintings” of deer and bear. 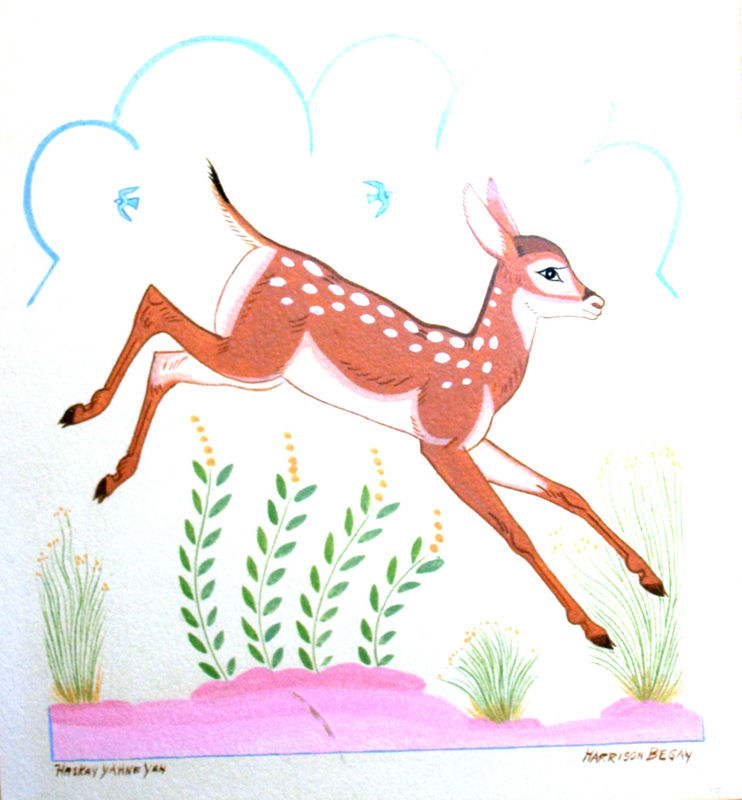 Originally, the creation of this Dorothy Dunn-style of Indian art was to help promote Native American arts and give talented Native artists a chance to make a living from their art. Perhaps it was too successful: Now, that style is considered “traditional,” and ordinary buyers of the art don’t want to look at anything that doesn’t fit the mold. And “Indian art” is a ghetto from which the truly talented feel pulled two ways: They want to escape the ghetto, yet, they want to create art from their cultural roots. The Southern Highland Craft Guild has done something of the same for mountain crafts. It was formed in 1929, and was an attempt to make some money for poverty-sticken mountain folk. Perhaps it has also worked too well, for there is little left of the mountains in these elegant doo-dads. 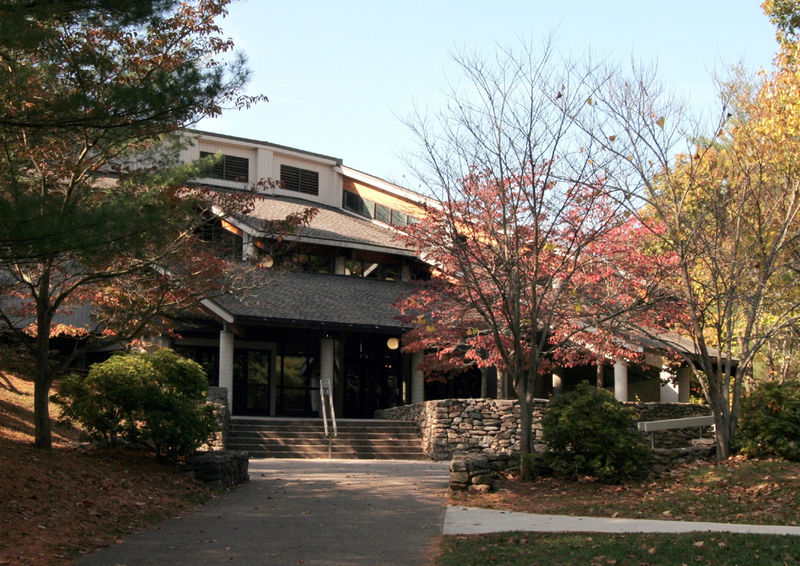 The tourists who glide through the Parkway Craft Center at Moses Cone Memorial Park, or the Folk Art Center on the Blue Ridge Parkway in Asheville, N.C., want souvenirs more than art, and they want something that portrays the fantasy of a “simpler way of life” that people “used to live” in the rural mountains. So, they find candles, stained glass, soft-colored quilts and jewelry in the form of dogwood flowers or bluebirds and feel they have come in contact with a more authentic way of life. But it ain’t so. Instead, they have come in contact with a successful marketing strategy. Some of the art is very nice, even beautiful in its way, but it is a far cry from anything that was made back in the hollers and coves when if you needed a ladle, you carved one from a chunk of wood. And Hollar’s bowls are beautiful: They exploit the essential beauty of woodgrain and its colors. He is a master craftsman. But no matriarch living in the cut-off coves of Appalachia before electrification who required a bowl for kneading dough would have been happy with one that sported a great hole in its side. You can find old recordings of some of that in the Alan Lomax collections. It is rough-hewn music, in a style that valued a keening, flat-affect voice — a style copied by Bill Monroe that he called the “high lonesome” — and always clearly amateur. You can hear the old music in re-releases of those Lomax recordings, like those made in 1941 of Emmett Lundy from Graham County in Virginia. There is a plaintive sourness in the playing, learned from his teacher, Green Leonard. No one would call the music pretty, yet it is intensely beautiful. It is authentic. The soft-toned flute jigs on the stereo are like no music I ever heard in the Appalachians. 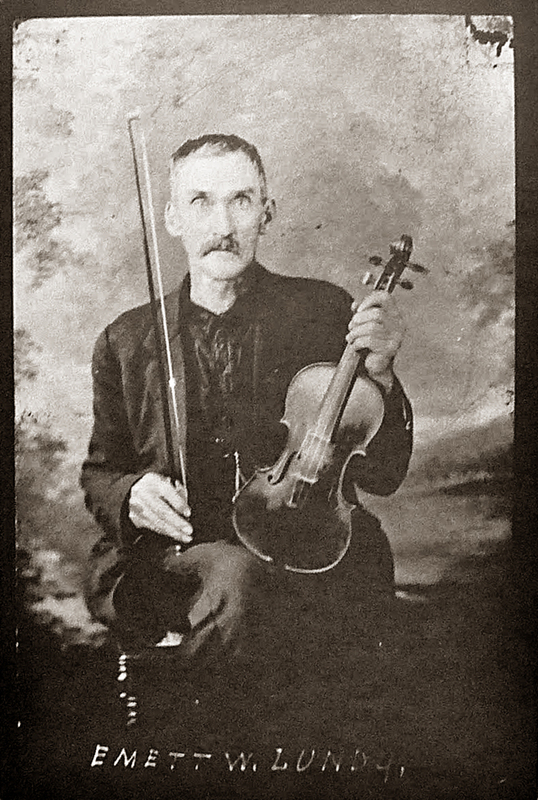 Where were the scratchy fiddle tunes with every note slightly flat? Where were the affectless hymn tunes sung by straight-lipped mountain families? Why is that hammer dulcimer playing The Two Fairy Hills instead of the the strummed dulcimer playing Rock of Ages? This is the mountain experience smoothed out and made marketable, giving the uninitiated the illusion of authenticity with none of the wood soot and bacon grease. The CDs are on a rack by the register. They are all prettified. “Do you have any really ugly music?” I ask. The young clerk — probably a college student from the flatlands come up to the mountains for a summer job among the “plainer, simpler folk” — doesn’t understand what I mean.